Come and celebrate the beginning of the New Year in style on 1st January with your loved ones at Sligachan Hotel with a delicious three course lunch and a glass of champagne beside our roaring fireplace for only £25 per person! Please see photos for full details and menu. Bookings essential so please contact Sligachan Hotel on 01478650204 or email us on reservations@sligachan.co.uk to make your booking. What better to bring in the bells than surrounded by your loved ones in the heart of Skye at Sligachan Hotel. Take advantage of our three night stay offer of £500.00 which includes three nights bed and breakfast, Hogmanay Dinner and Ceilidh and a bottle of champagne on arrival. Please contact Sligachan Hotel on 01478650204 or email us on reservations@sligachan.co.uk to make your booking. 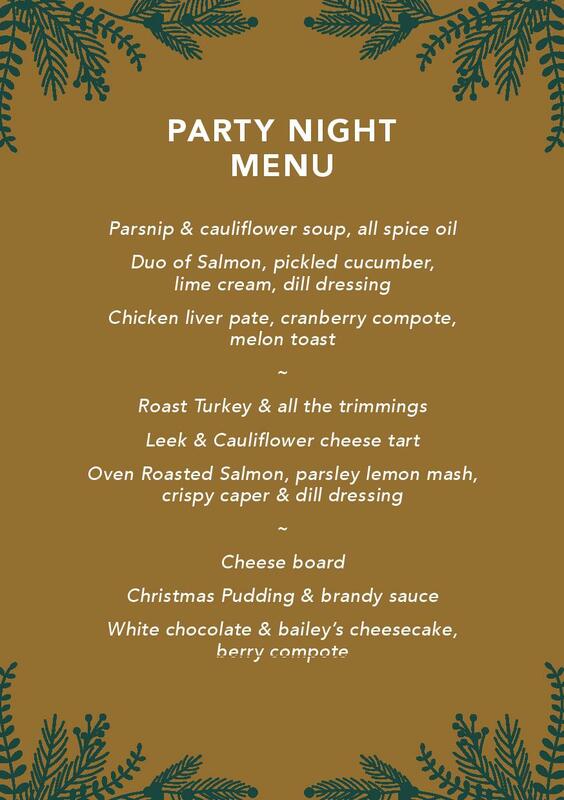 Join us with your work colleagues, friends or family at one of our FESTIVE PARTY NIGHTS! For only £23 per person let us wine, dine and entertain you with a delicious three course meal, a glass of house wine plus live entertainment and music to get you into the XMAS party spirit! Please see photos for full details and menu. Come join us for a delicious three course festive lunch during the most wonderful time of the year! Offer includes a glass a glass of Sligachan Mulled Wine or House Wine on arrival for only £18.95 per person. Please see photos for full details and menu. Bookings essential. 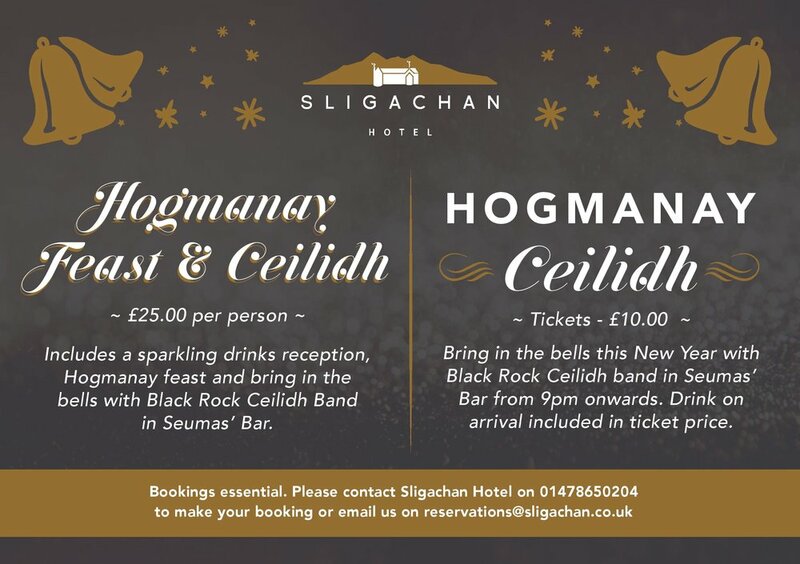 Please contact Sligachan Hotel on 01478650204 or email us on reservations@sligachan.co.uk to make your booking. Join us for our fun pub quiz every Friday night! 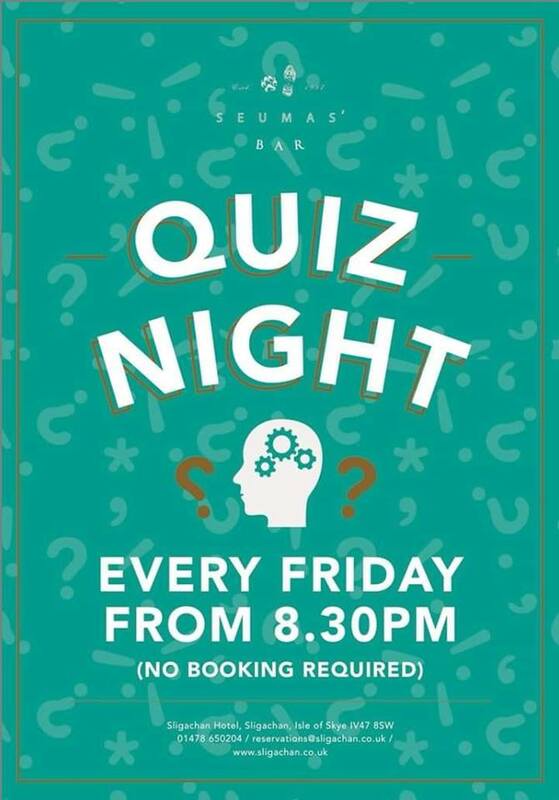 Join us every Friday night for our fun Pub Quiz! Join George McPherson in our collies lounge in the hotel for an evening of wonderful storytelling perfect for all ages. Join singer songwriter Alan Frew in Seumas' Bar as he plays great covers and his own songs in Seumas' Bar. Come along and enjoy live music and learn traditional Scottish dances from the incredible Borland Ceilidh Band! Come along and enjoy live music from The Woo Town Hillbillies from 9.30pm in Seumas' Bar! Join us for our weekly pub quiz night in Seumas' Bar from 8.30pm... Each week we have prizes for first, second and third place with the prize money rolling over week by week if it isn't won! Come along and join us on our favourite day of the year the historic Glamaig Hillrace! If you are planning to participate or just want to come and soak up the atmosphere there will be plenty actives for all the family to enjoy including our famous duck ruck, live music and raffles! Join Flavio for a HIIT workout in Seumas' Bar from 8.30am every Tuesday in Seumas' Bar... the perfect way to start the day! Dance your socks off with the Fulltones from 9.30pm in Seumas' Bar. Scottish Opera is packing up its theatre on wheels and taking The Pop-up Opera Roadshow to Festival 2018. Two brilliant 25-minute shows for audiences of all ages are brought to life by a storyteller, singers, musicians and a series of colourful illustrations, offering a fantastic introduction to opera. Both shows are performed in a specially-adapted, fully-accessible trailer, re-creating Glasgow’s Theatre Royal. Join us for a version of Gilbert and Sullivan’s classic A Little Bit of HMS Pinafore and Be a Sport, Spike!, a new work for kids aged 4 to 7.